Mick Vann is determined to keep the Chronicle relevant in this modern era of Austin food letters. Options are endless if you’re looking for information on where to go and what to eat in town with thousands of avenues for one to walk down as they seek the perfect pho, sublime scratch tortillas or exemplary yom nua. In the current edition of the entertainment weekly Vann begins his excellent piece with a barbacoa history lesson for the reader. He explains the origin of the term then guides us on a journey through southern, central and northern Mexico explaining the regional variants on the style as he goes. We’re well versed on the subject but the writer offers valuable insight for the casual eater of the genre. We love to see Vera’s Backyard Barbecue down in Brownsville Texas getting some acclaim as it’s the finest we’ve ever put in our mouth. We’ve heard that there are a handful of ancient meat houses in the state that are legally allowed to offer true, pit barbacoa but this is the only one we’ve visited. It’s an 8 hour drive from Austin but one we recently made with a song in our heart as we knew what awaited us when we arrived.If you’re fortunate enough to go, do not neglect the salsa as it’s among the top 3 we’ve ever sampled. Leaving Brownsville, Mick Vann motors back up to Austin where he chimes in on the sad news regarding La Monita’s closure. 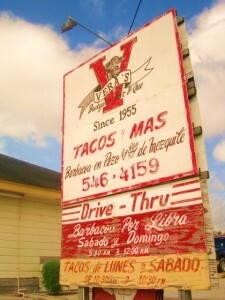 We spoke with owner Antonio a while back and East Austin’s barbacoa king is indeed plotting a 2012 return, lending veritas to Vann’s reportage. He then vectors in on Austin’s finest Mexican restaurant; El Taco Rico in the Montopolis neighborhood. Yolanda Cornejo is the best Mexican cook in town and that’s saying plenty. Her barbacoa would sell well in the Rio Grande Valley and that’s about all that needs to be said. Next Vann hits up two Mexican meat markets: Las Delicias and La Michoacana. We have a storied history with both of these markets through teaching a variety of their workers the finer points of the English language a few years back. Each brand is remarkable with Las Delicias occupying one storefront on William Cannon and La Michoacana’s scattered all over town. We were somewhat surprised to see that La Moreliana did not make the list as they fit the Mexican meat market bill quite ably and offer top flight barbacoa. We’re long time fans of Mi Ranchito, Mr. Vann’s next entry. While we’re not crazy about their tortillas the barbacoa is good and we agree as to the salsa bar’s general excellence. It’s contracted by a few lexans on the last few visits but is still the best in town. We remember when El Borrego de Oro opened in Austin a good fifteen years ago on south first street and could not believe how good it was. They’re in a much larger space now and offer a wonderful goat and/or sheep barbacoa. We love their soups. This is one of Austin’s best Mexican soul food restaurants. Back when we were in the Mexican wrestling promotion business Taqueria Chapala was always there for us as we navigated through the East Austin scene. We haven’t eaten there in some time but do remember the entire menu to be a good one. Mick Vann finishes his barbacoa tour of Austin with a visit to La Canaria up on Airport Blvd and finds it lacking. We generally stick with the posole and carnitas at this cart and do just fine. Can’t remember the barbacoa which is not a good sign. We love that there are other journalists out there beating the streets and digging for the under the radar Austin meat houses. We’ve always enjoyed Vann’s work as he’s clearly a dyed in the wool chowhound. Something that’s sorely lacking at the Chronicle as their workers slowly slip into their dotage.